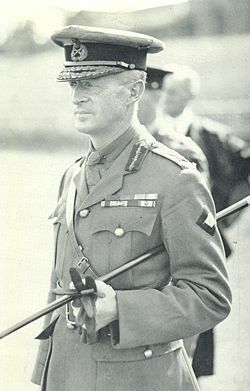 "Cocky" Bennett was the 54-year-old commander of the Australian 8 Division, which was shipped to Singapore just before the outbreak of hostilities. Though 8 Division was originally raised in 1940, it was treated as a training cadre for replacements for the three Australian divisions already deployed in North Africa, and it never reached a high state of training and readiness. Bennett himself, like almost all Australian officers, was a civilian between the wars, and became wealthy as an actuary. He seems to have been a competent division commander, but proved less able when thrust into a corps command. His concentration of his forces around Gemas, leaving only 45 Indian Brigade to guard the coastal plain, proved faulty. This led to the destruction of 45 Indian Brigade, the unhinging of the Allied line, and the loss of southern Malaya. His dispositions are particularly difficult to understand given his deep contempt of Indian troops and faith in his own Australian troops. Bennett was perhaps recklessly aggressive. His diary on 31 January 1942, after the Allies had been thrown out of mainland Malaya by the Japanese, records his view that the Allies should counterattack out of Singapore and reclaim Malaya. This was entirely unrealistic under the circumstances at the time. When Singapore fell, Bennett managed to escape to Australia, where he publicly denounced the British military leadership. This was political dynamite, given the growing sense among the Australian public that Britain had abandoned them to their fate and that Australia must turn to the United States for military help. As a result, the Australian military leadership saw to it that Bennett never again had a combat command, and his initial public image as a brave soldier who had cleverly escaped the Japanese was respun to that of a commander who had abandoned his men. The irony is notable (though it must also be noted that MacArthur escaped under orders from his superiors.) Postwar, a court of inquiry ruled that Bennett should have surrendered with his soldiers. The idea for the escape does not seem to have originated with Bennett himself, but with his staff, who were determined to get out themselves. However, there is no indication Bennett did anything to discourage the idea. Part of the reason Bennett was sidelined likely was his poisonous relationship with Thomas Blamey. Blamey never forgave Bennett for a prank in 1912 (which Bennett denied involvement in) and, when Bennett received 14 days' leave to get married in 1916, Bennett managed to get this reduced to 10 days' leave. It did not help that both men were notorious for being difficult to get along with, insubordinate, and consumed with ambition. Bennett also wrote a series of tactless articles in 1937 claiming that regular officers were trained for staff work and militia officers were more suitable for combat commands.